Italian has always been my favourite cuisine. There’s nothing quite as comforting as a big bowl of pasta coated in cheese or a hot slice of pizza scattered with toppings. But when it comes to eating out, it can be hard to find a tasty dish without sitting down at a fancy restaurant and settling in for an hour or two. Grabbing something on the go usually means sacrificing the quality of the meal. That’s where a place like Eatalio steps in. It’s casual and quick, but in terms of taste- it delivers. Situated at a convenient spot halfway along Queen’s Road, along the main road from the station to the sea, its well placed to lure in day trippers and commuters alike. Stepping inside from the busy road, the room is big and spacious with benches and large tables to cater for families and groups as well as bar stools for lone snackers. The decor is vibrant and bold, with bright lighting from silver spotlights illuminating the space. The walls are papered with newspaper, overlaid with colourful sketches (of everything from an alien robot to the Vitruvian man) against a hazy orange and yellow painted background. It sounds mad- but it works. A long bar wraps around half the space with a giant red arrow directing wanderers from the street to their starting point. 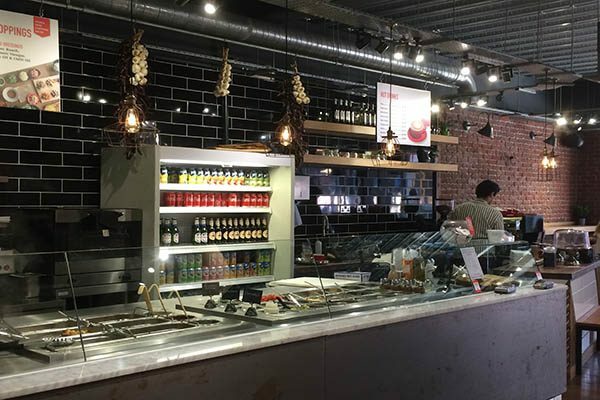 The menu is simple- you can pick from three dish bases: pasta bowls, salads or hand rolled piada- which is a thin Italian flat bread. At the next stage, you can choose between a variety of main fillings- among them a rosemary and lemon chicken, spicy Italian sausage, crispy chicken fillet or British rump steak, as well as a vegetarian option of grilled seasonable vegetables. Finally, you add a hot or cold sauce or salad dressing and three other toppings. 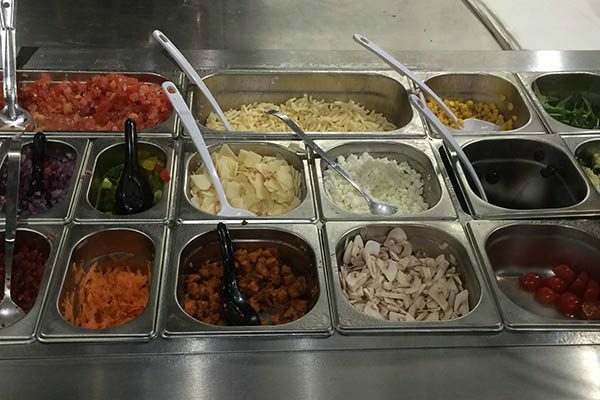 Faced with so much decision making ahead we dithered, eyes roving from the fresh smelling sauces to the colourful array of toppings. I decided on the pasta and went for a simple penne over the admittedly more exciting sounding angel hair. With it, I selected chunks of British rump steak with a classic pomodoro sauce made of fresh tomato and chopped basil. To sprinkle on top, I chose mozzarella gratings, olives and sundried tomatoes. I moved along the bar with the man serving me, watching him create my lunch stage by stage. It was nice to be able to see how fresh the ingredients were myself and appreciate how piping hot the finished product was, despite the food being out on display. I wanted comforting and I wasn’t disappointed- the pasta was cooked expertly to a firm texture, the sauce was fresh and flavoursome in the way that only good quality tomatoes can be. My extra toppings made it all the more exciting- the sun dried tomatoes adding a chewy tang to the dish and the generous helping of mozzarella making it even more filling. My boyfriend decided to try a piada, choosing the fennel sausage option. 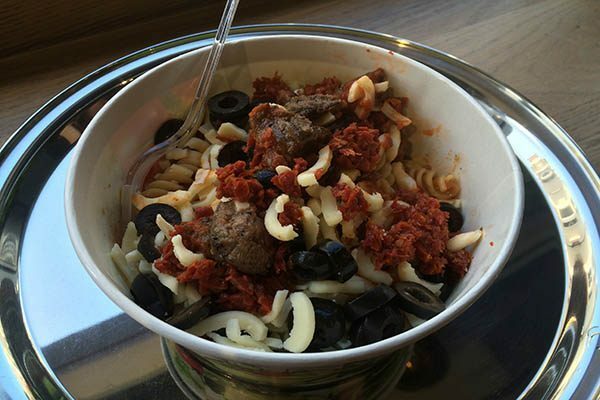 He opted for the more daring tomato sauce – the spicy diavola – topped with sundries tomatoes, olives and a handful of parmesan. Intrigued by the sound of it, I was impressed with my taste of the fennel sausage in the mix. Though the fennel stood out as the dominant flavour it also allowed for the taste of the other herbs to come through. Chopped up into meatball style chunks, overall it added a bright flavour to the wrap. The piada itself was thin and light, a strong vessel for the substantial concoction it held inside. The diavola sauce was hot without being overbearingly spicy, and the olives and extra tomatoes helped bulk it all out with fresh and juicy pieces. Both portions surprised me by their substantial size, but neither meals were too heavy. We were also treated to a taste of what was probably the highlight of the visit: two freshly made ‘sorrentinas’. 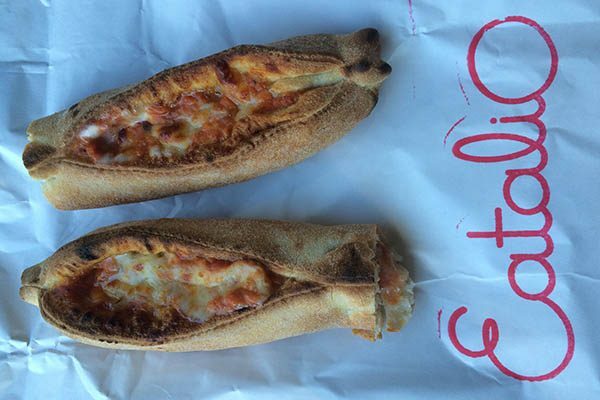 They were breaded strips, fresh out the oven and hot to touch, doused in dough and bursting with a dripping tomato and cheese mixed filling. Needless to say they disappeared in a just few mouthfuls- a fleeting example of Italian street food at its finest. 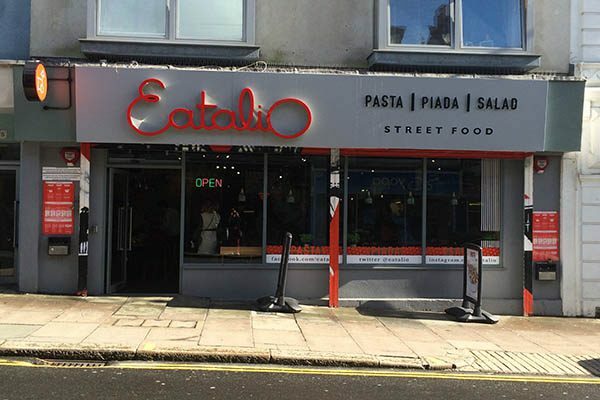 With a range of drinks from juice to beer and a small selection of desserts freshly made for the day, Eatalio is perfect for a convenient but classy stop off. Its welcoming atmosphere and gentle buzz make it an inviting spot to drop by and fill up on something warming and hearty. 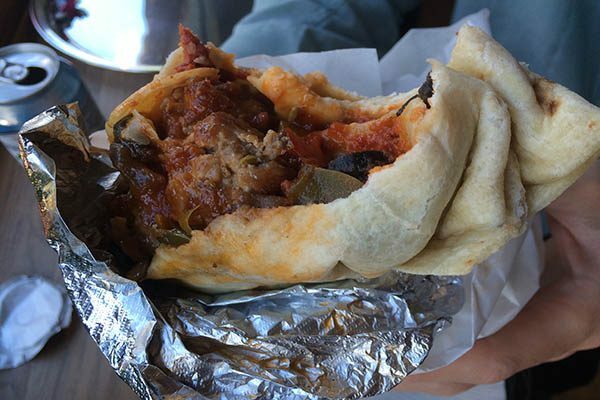 VIDEO: What is a Piada?